Greenland, (Greenlandic: Kalaallit Nunaat, meaning "Land of the Kalaallit (Greenlanders)," the largest island in the world, is located between the Arctic Ocean and the North Atlantic Ocean, northeast of Canada and northwest of Iceland. Greenland has no land boundaries and 24,430 miles (39,330 km) of coastline, a distance roughly equivalent to the Earth's circumference at the Equator. A sparse population is confined to small settlements along the coast. Greenland possesses the world's second largest ice sheet, which covers over 80 percent of its land mass. It is a self-governing Danish province. Though physiographically and ethnically an Arctic island nation associated with the continent of North America, politically and historically Greenland is closely tied to Europe, specifically Iceland, Norway, and Denmark. In 1978, Denmark granted home rule to Greenland, making it an equal member of the Rigsfællesskab. The island is noted for its vast tundra, immense glaciers, and long deep fjords. The vegetation is generally sparse, with the only patch of forested land being found in Nanortalik Municipality in the extreme south near Cape Farewell. The terrain is mostly a flat but gradually sloping icecap that covers all land except for a narrow, mountainous, barren, rocky coast. The northernmost point of Greenland proper is Cape Morris Jesup, discovered by Admiral Robert Peary in 1909. Natural resources include zinc, lead, iron ore, coal, molybdenum, gold, platinum, uranium, fish, seals, and whales. Greenland was also called Gruntland ("Ground-land") and Engronelant (or Engroneland) on early maps. Whether green is an erroneous transcription of grunt ("ground"), which refers to shallow bays, or vice versa, is not known. It should also be noted, however, that the southern portion of Greenland (not covered by glacier) is indeed very green in the summer, and was likely to have been even greener in Erik's time because of the Medieval Warm Period. About 80 percent of its surface is covered by ice, known as the Greenland ice sheet, the weight of which has depressed the central land area to form a basin lying more than 300 meters (984 ft) below the surrounding ocean. 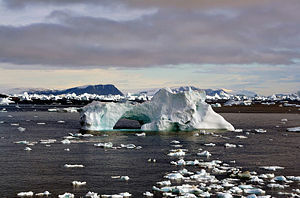 Approximately one-twentieth of the world's ice and one-quarter of the earth's surface ice is found in Greenland. The total area of Greenland measures 836,109 square miles (2,166,086 sq km), of which the Greenland ice sheet covers 677,676 sq mi (1,755,637 km²), or 81 percent. The coastline of Greenland is 24,430 mi (39,330 km) long, about the same length as the Earth's circumference at the Equator. At least four scientific expedition stations and camps had been established in the ice-covered central part of the island: Eismitte, North Ice, North GRIP Camp and The Raven Skiway. A year-round station, Summit Camp, was established on the ice sheet 1989. The radio station Jørgen Brøndlund Fjord was, until 1950, the northernmost permanent outpost in the world. 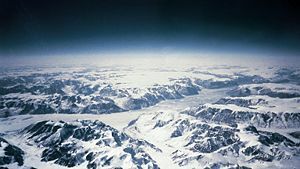 The extreme north of Greenland, Peary Land, is not covered by an ice sheet due to the dryness of its air, which is too dry to produce snow, essential in the production and maintenance of an ice sheet. If the Greenland ice sheet were to completely melt away, sea level would rise by more than 23 feet (7 m),  and Greenland would most likely become an archipelago. Greenland's vegetation is mainly categorized as tundra. Plants consist of sedge, cotton grass, and lichen. There are few trees, though some dwarfed specimens of birch, willow, and alder scrub grow in the limited ice-free areas. There are seven species of land mammals including arctic foxes, ermines, lemmings, musk-oxen, polar bears, reindeer, and snow hares. The surrounding waters are home to seals and whales, as well as cod, salmon, flounder, and halibut. The island's rivers contain salmon and trout. 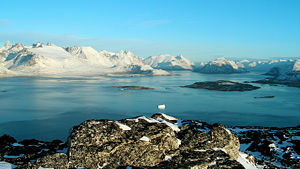 A scene from South Greenland, near Nanortalik, where fjords and mountains dominate the landscape. Climatically, Greenland is divided into two very separate regions: the coastal region, much of which is ice free, and the inland ice sheet. The Greenland Ice Sheet covers about 80 percent of the island, extending to the coast in places, and has an average elevation of 2.1 km (6900 feet) and a maximum elevation of 3.2 km (10,500 feet). Much of the ice sheet remains below freezing all year, and it has the coldest climate of any part of the Arctic. Coastal areas can be affected by nearby open water, or by heat transfer through sea ice from the ocean, and many parts lose their snow cover in summer, allowing them to absorb more solar radiation and warm more than the interior. Coastal regions on the northern half of Greenland experience winter temperatures similar to or slightly warmer than the Canadian Archipelago, with average January temperatures of −30 °C to −25 °C (−22 °F to −13 °F). These regions are slightly warmer than the Archipelago because of their closer proximity to areas of thin, first-year sea ice cover or to open ocean in the Baffin Bay and Greenland Sea. The coastal regions in the southern part of the island are influenced more by open ocean water and by frequent passage of cyclones, both of which help to keep the temperature there from being as low as in the north. As a result of these influences, the average temperature in these areas in January is considerably higher, between about −20 °C and −4 °C (−4 °F and +25 °F). The interior ice sheet escapes much of the influence of heat transfer from the ocean or from cyclones, and its high elevation also acts to give it a colder climate since temperatures tend to decrease with elevation. The result is winter temperatures that are lower than anywhere else in the Arctic, with average January temperatures of −45 °C to −30 °C (−49 °F to −22 °F), depending on location and on which data set is viewed. Minimum temperatures in winter over the higher parts of the ice sheet can drop below −60 °C (−76 °F; CIA, 1978). In the station climatology figure above, the Centrale plot is representative of the high Greenland Ice Sheet. 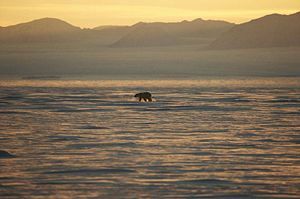 In summer, the coastal regions of Greenland experience temperatures similar to the islands in the Canadian Archipelago, averaging just a few degrees above freezing in July, with slightly higher temperatures in the south and west than in the north and east. The interior ice sheet remains snow covered throughout the summer, though significant portions do experience some snow melt. This snow cover, combined with the ice sheet's elevation, help to keep temperatures here lower, with July averages between −12 °C and 0 °C (10 °F and 32 °F). Along the coast, temperatures are kept from varying much by the moderating influence of the nearby water or melting sea ice. In the interior, temperatures are kept from rising much above freezing because of the snow-covered surface but can drop to −30 °C (−22 °F) even in July. Temperatures above 20°C are rare but do sometimes occur in the far south and south-west coastal areas. Hunting and whaling have always been important ways to make a living on Greenland. 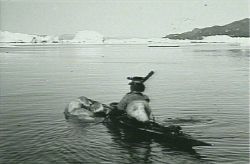 Polar bear hunter, 1904. 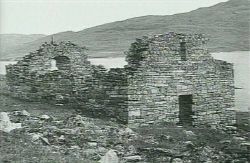 The last written records of the Norse Greenlanders are from a 1408 marriage in the church of Hvalsey – today the most well-preserved of the Norse ruins. Greenland, which is about one quarter the size of the United States and about the size of Saudi Arabia, was home to a number of Paleo-Eskimo cultures in prehistory. From 984 C.E., it was colonized by Norse settlers who lived in two settlements on the west coast on the fjords near the very southwestern tip of the island. The Norse settlements thrived for the next few centuries, and then disappeared sometime in the 15th century after nearly 500 years of habitation. Data obtained from ice cores indicate that between 800 and 1300 C.E. the regions around the fjords of the southern part of the island experienced a relatively mild climate similar to today. Trees and herbaceous plants grew in the south of the island and the prevailing climate initially permitted farming of domestic livestock species as farmed in Norway. These remote communities thrived and lived off farming, hunting and trading with the motherland, and when the Norwegian kings converted their domains to Christianity, a bishop was installed in Greenland as well, subordinate to the archdiocese of Nidaros. 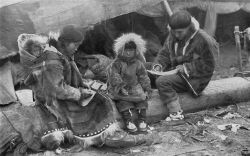 The settlements seem to have coexisted relatively peacefully with the Inuit, who had migrated southwards from the Arctic islands of North America around 1200. In 1261, Greenland became part of the Kingdom of Norway. After almost five hundred years, the Scandinavian settlements vanished, likely due to famine and increasing conflicts with the Inuit during the fourteenth and fifteenth centuries. Main contributors to the demise of the Norse settlements appeared to have been destruction of the natural vegetation for farming, turf, and wood by the Norse and ensuing soil erosion and a decline in local temperatures during the Little Ice Age, as well as armed conflicts with the Inuit. The condition of human bones from this late period indicates malnutrition of the Norse population. It has been suggested that cultural practices, such as spurning fish as a source of food and reliance solely on livestock ill-adapted to Greenland's climate caused recurring famines, which along with environmental degradation resulted in the abandonment of the Greenland Norse colony. Denmark-Norway reasserted its latent claim to the colony in 1721. The island's ties with Norway were severed by the Treaty of Kiel of 1814, through which Norway was ceded to the king of Sweden, while Denmark retained all of her common overseas possessions: the Faeroe Islands, Iceland and Greenland, as well as Denmark-Norway's small territories in India (Tranquebar), West Africa (Danish Gold Coast), and the West Indies (Danish Virgin Islands). Norway occupied and claimed parts of (then uninhabited) East Greenland, also known as Erik the Red's Land, in July 1931, claiming that it constituted Terra nullius. Norway and Denmark agreed to settle the matter at the Permanent Court of International Justice in 1933, where Norway lost. During World War II, Greenland's connection to Denmark was severed on April 9, 1940 when Denmark was occupied by Germany. Through the cryolite from the mine in Ivigtût, Greenland was able to pay for goods bought in the United States and Canada. During the war the system of government changed. Eske Brun was governor and ruled the island via a 1925 law concerning the governing of the island where, under extreme circumstances, the governors could take control. The other governor, Aksel Svane, was transferred to the United States as leader of the commission to supply Greenland. The Sirius Patrol, guarding the northeastern shores of Greenland using dog sleds, detected and destroyed several German weather stations, giving Denmark a better position in the postwar turmoil. Greenland had been a protected and thereby very isolated society until 1940. The Danish government, which governed the colonies of Greenland, had been convinced that the society would face exploitation from the outside world or even extinction if the country was opened up. During World War II, though, Greenland developed a sense of self-reliance during its period of self-government and independent communication with the outside world. However, a commission in 1946 (with the highest Greenlandic council Landsrådet as participant) recommended patience and no radical reformation of the system. Two years later the first step towards an alteration of the governing of Greenland was initiated when a grand commission was founded. In 1950 the report (G-50) was presented. Greenland was to be a modern welfare society with Denmark as the sponsor and example. In 1953, Greenland was made an equal part of the Danish Kingdom; home rule was granted in 1979. 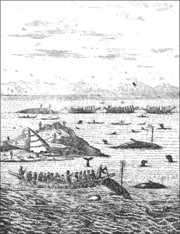 The Thule were skilled whalers, as depicted here by Norwegian missionary Hans Egede in the eighteenth century. The colonial status of Greenland was lifted in 1953, when it became an integral part of the Danish kingdom, with representation in the Folketing. Denmark also began a program of providing medical service and education to the Greenlanders. As a result, the population became more and more concentrated to the towns. Since most of the inhabitants were fishermen and had a hard time finding work in the towns, these population movements may have contributed to unemployment and other social problems that have troubled Greenland since. As Denmark engaged in the European cooperation later to become the European Union, friction with the former colony grew. Greenlanders felt the European customs union would be harmful to their trade, which was largely carried out with non-European countries such as the United States and Canada. After Denmark, including Greenland, joined the union in 1973 (despite 70.3 percent of Greenlanders having voted against entry in the referendum), many residents thought that representation in Copenhagen was not sufficient, and local parties began pleading for self-government. The Folketing granted this in 1978, the home rule law coming into effect the following year. On February 23, 1982, a majority (53 percent) of Greenland's population voted to leave the European Community, which it did in 1985. Self-governing Greenland has portrayed itself as an Inuit nation. Danish placenames have been replaced. The center of the Danish civilization on the island, Godthåb, has become Nuuk, the capital of a close-to-sovereign country. In 1985, a Greenlandic flag was established, using the colors of the Danish Dannebrog. However, the movement for complete sovereignty is still weak. International relations, a field earlier handled by Denmark, are now left largely, but not entirely, to the discretion of the home rule government. After leaving the EU, Greenland has signed a special treaty with the Union, as well as entering several smaller organizations, not least with Iceland and the Faeroe Islands, and with the Inuit populations of Canada and Russia. It was also one of the founders of the environmental Arctic Council cooperation in 1996. Modern technology has made Greenland more accessible, not least due to the breakthrough of aviation. However, the capital Nuuk still lacks an international airport. Television broadcasts began in 1982. Politics of Greenland takes place in a framework of a parliamentary representative democratic Danish dependency, whereby the Prime Minister is the head of government, and of a pluriform multi-party system. Greenland has been a self-governing overseas administrative division of Denmark since 1979. The monarch of Denmark is also head of state of Greenland. She is represented by a High Commissioner, appointed by her. The Prime Minister is elected by Parliament and leads the Landsstyre. Executive power is exercised by the government. Legislative power is vested in both the government and the Parliament of Greenland (known as Landsting). The Judiciary is independent of the executive and the legislature. The party system is dominated by the social democratic Forward, the separatist and socialist Inuit Community and the conservative liberal Feeling of Community. Unlike Denmark, Greenland is not part of the European Union, having left the European Community, one of the pillars of the EU, in 1985. The Government of Greenland does not have control of her military or foreign affairs. The defense of the island is the responsibility of Denmark. Several American and Danish military bases are located in Greenland, including the US Thule Air Base. The Danish army operates a dog sled patrol called Sirius-patruljen, based in Daneborg. Greenland also has a coastguard that patrols the Greenlandic coast and carries out search and rescue operations. Greenland today is critically dependent on fishing and fish exports; the shrimp fishing industry is by far the largest income earner. Despite resumption of several interesting hydrocarbon and mineral exploration activities, it will take several years before production can materialize. The state oil company NUNAOIL was created in order to help develop the hydrocarbon industry. Tourism is the only sector offering any near-term potential and even this is limited due to a short season and high costs. The public sector, including publicly owned enterprises and the municipalities, plays the dominant role in Greenland's economy. About half the government revenues come from grants from the Danish Government, an important supplement to the gross domestic product (GDP). Gross domestic product per capita is equivalent to that of the weaker economies of Europe. Greenland suffered economic contraction in the early 1990s, but since 1993 the economy has improved. The Greenland Home Rule Government (GHRG) has pursued a tight fiscal policy since the late 1980s which has helped create surpluses in the public budget and low inflation. Since 1990, Greenland has registered a foreign trade deficit following the closure of the last remaining lead and zinc mine in 1990. The transportation system in Greenland is very unusual in that it has no railways, no inland waterways and virtually no roads between towns. There is a total of 90 miles (150 km) of roads in the entire country, of which 40 miles (60 km) are paved. There is only one pair of towns that are connected by a road, Ivittuut and Kangilinnguit. The rest are isolated. Historically the major means of transportation have been by boat around the coasts of the country in summer and by dog sled in winter, particularly in the north and east. There are ports at Kangerluarsoruseq, Kangerlussuaq (also known by its Danish name Søndre Strømfjord), Nanortalik, Narsarsuaq, Nuuk (Godthåb) and Sisimiut. Following the ceding of operational control of Greenland to the United States by Denmark for the period in which that country was occupied by Germany during World War II, airports were built on the island. The airports were codenamed Bluie West One through to Bluie West Eight on the west of the island and Bluie East One to Bluie East Four on the eastern side. The largest of those airports, Bluie West Eight, now renamed Kangerlussuaq Airport, remains the international hub for travel to Greenland, as it is the only airport that has a large enough runway to service jumbo jets. American authorities at one time entertained the idea of building a road from Kangerlussuaq to the second largest airport, in Narsarsuaq, several hundred kilometers (miles) to the south. The idea was abandoned after feasibility studies failed to prove it was possible. Greenland now has a total of 18 airstrips, 14 of which are paved. All internal flights are operated by Air Greenland. International flights are limited to thrice weekly flights from Copenhagen to Kangerlussuaq and also to Narsarsauq with Air Greenland. Air Iceland fly from Reykjavík to Narsarsuaq and offer "day trips to the wilderness" from Reykjavík to Kulusuk on the east coast. 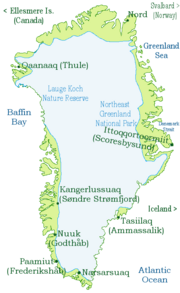 The official languages of Greenland are Greenlandic (Kalaallisut) and Danish, and most of the population speak both of the languages. Greenlandic is spoken by about 50,000 people, some of whom are monolingual. A minority of Danish migrants with no Inuit ancestry speak Danish as their first, or only, language. English is widely spoken as a third language. The Greenlandic language is the most populous of the languages of the Eskimo-Aleut language family, having as many speakers as all the other languages of the family combined. Within Greenland three main dialects are recognized: the northern dialect Inuktun or Avanersuarmiutut spoken by around 1000 people in the region of Qaanaaq, Western Greenlandic or Kalaallisut which serves as the official standard language, and the Eastern dialect Tunumiit oraasiat or Tunumiutut spoken in eastern Greenland. The culture of Greenland has much in common with Inuit tradition, as the majority of people are descended from Inuit. Many people still go ice-fishing and there are annual dog-sled races in which everyone with a team participates. However, Greenland has now become somewhat of a tourist attraction. It holds contests such as dog racing, ice fishing, hiking, and cross country racing in order to attract tourists. 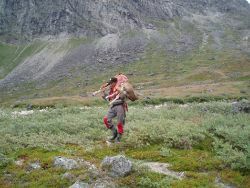 Hunting is iconic to their culture and most Greenlanders still hunt at least part-time to supplement their diet and provide skins for clothing and kayaks. Traditional foods such as seal, walrus, narwhal and caribou, are consumed frequently. Hunters still wear hand-made polar bear skin garments, caribou anoraks and skin boots for warmth on winter hunting trips. Many of the men maintain world-class kayaking and harpoon-throwing skills. Reindeer hunting has a special status in the hearts of the populace. Shooting a musk ox provides four times as much meat as a reindeer, but most prefer to eat caribou or reindeer meat. "But the experience is just as important [as the meat]," points out Peter Nielsen, Head of Office at the Ministry of Environment and Nature. "It is simply the most wonderful part of the year. The trips in for the caribou hunt in the beautiful autumn weather have a great social and physical meaning for people's wellbeing. It has many functions." The long history of mutual dependence between humans and reindeer necessitates continuing efforts to safeguard their relationship and the welfare of both parties. The Inuit and the Danish peoples of Greenland have both maintained their distinct styles of folk music. Country-wide folk traditions included storytelling, which declined greatly after the introduction of the South Greenland Printing Press in 1857. Traditional music which has best survived European contact can be found in the east and northeast of the island. It includes sacred drum dances played on an oval drum made of a wooden frame with a bear-bladder on top. Drum dances are the "only truly indigenous music" in Greenland, and are part of a roots revival in modern times. Shamans used drums as part of their religious affairs and sometimes organized singing duels between rivals in which the performer who got the most laughs from the audience won. Inuit drum dances were a declining tradition and in modern Greenland are being replaced by amateur theater groups such as Silamiut, who used elements of indigenous music with masks, face painting and other techniques. Piseq are a form of personal song that comment on daily life; these are often handed down from generation to generation. Greenlandic Inuit folk songs are performed to tell stories, play games and tease or charm others. The Greenland National Football Team is controlled by the Football Association of Greenland. Greenland is not a member of FIFA nor of any continental confederation and therefore is not eligible to enter the World Cup or other sanctioned tournaments. Most of the matches they have played have been against the Faroe Islands and Iceland, but neither of the two consider those games full internationals. It has also played Tibet, since neither are FIFA members. Greenland is a member of the International Island Games Association and has taken part in football (soccer) at the Island Games. Since October 13, 2005 it is a provisional member of the NF-Board and since March 25, 2006 it is full-member. Most Greenlander players are eligible to play for Denmark, since Greenland is officially part of the country. FIFA's recent approval of FieldTurf may allow Greenland to create FIFA-standard playing pitches and apply to play full internationals. They would join either UEFA (due to links with Denmark), or CONCACAF (geographically, Greenland is part of North America). ↑ "Grønlands Statistik". stat.gl. Retrieved July 21, 2017. ↑ Greenland in Figures 2013 Statistics Greenland. Retrieved July 21, 2017. ↑ J. Sephton, Eirik the Red's Saga January 12, 1800. National Library of Iceland and Cornell University Library. Retrieved July 28, 2017. ↑ Stefan Lovgren, Greenland Melt May Swamp LA, Other Cities, Study Says National Geographic News, April 8, 2004. Retrieved July 28, 2017. ↑ Richard B. Alley, The two-mile time machine ice cores, abrupt climate change, and our future (Princeton, NJ: Princeton University Press, 2000, ISBN 0691004935). 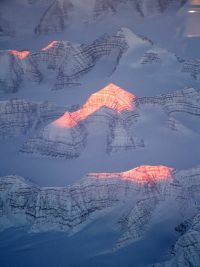 ↑ John Roach, Greenland Glaciers Losing Ice Much Faster, Study Says National Geographic, February 16, 2006. Retrieved July 28, 2017. ↑ Konrad Steffen, Nicloas Cullen, and Russell Huff, CLIMATE VARIABILITY AND TRENDS ALONG THE WESTERN SLOPE OF THE GREENLAND ICE SHEET DURING 1991-2004 University of Colorado (USA) and University of Innsbruck (Austria). Retrieved July 28, 2017. ↑ Lucy Sherriff, Satellite shows Greenland's ice sheets getting thicker The Register, November 7, 2005. Retrieved July 28, 2017. ↑ Eske Willerslev, et. al., Ancient Biomolecules from Deep Ice Cores Reveal a Forested Southern Greenland Science 317 (5834) (July 6, 2007): 111-114. Retrieved July 28, 2017. ↑ 10.0 10.1 10.2 10.3 Jared Diamond, Collapse—How Societies Choose to Fail or Succeed (Penguin Books, 2005, ISBN 0143036556). Diamond dedicates two whole chapters to the Greenland Norse and their demise, claiming their story is a very good example of multiple factors bringing down a society. ↑ Jared Diamond, Why societies collapse Australian Broadcasting Corporation Science Online (2002). Retrieved July 28, 2017. ↑ Robert McGhee, Contact between Native North Americans and the Medieval Norse: A Review of the Evidence American Antiquity 49(1) (Jan. 1984): 4-26. Retrieved July 28, 2017. ↑ Greenland. Greenland, Land of the People Retrieved July 27, 2018. ↑ Henriette Rasmussen,Sustainable Greenland and Indigenous Ideals The Earth Charter in Action. Retrieved July 28, 2017. ↑ The Danish-Greenlandic Environmental Cooperation, Caribou and musk oxen are meat and adventure 2001. Retrieved July 28, 2017. Bardarson, Ivar, and Finnur Jonsson. Det gamle Gronlands beskrivelse af Ivar Bardarson. Copenhagen: Levin and Munksgaard, 1930. Lund, S. "The Marine Algae of East Greenland. 1. Taxonomical Part." Meddr Gronland 156(1) (1959): 1-245. Lund, S. "The Marine Algae of East Greenland. 11. Geographic Distribution." Meddr Gronland 156 (1959): 1-70. Steffen, Konrad, N. Cullen, and R. Huff. "Climate variability and trends along the western slope of the Greenland Ice Sheet during 1991-2004." Proceedings of the 85th American Meteorological Society Annual Meeting San Diego, 2005. Willerslev, E. E. Cappellini, W. Boomsma, R. Nielsen, M.B. Hebsgaard, T.B. Brand, M. Hofreiter, et al. "Ancient biomolecules from deep ice cores reveal a forested southern Greenland." Science 317(5834) (2007): 111-1114. New York, NY. The Official Tourism & Business Council of Greenland. This page was last modified on 28 July 2017, at 19:37.